It’s funny how you can become fixated on the potential for things to go wrong at a particular time. You look at the situation and place some type of possible danger-score on it and tread lightly or carefully. Maybe that keeps mishap at bay. Or maybe whatever is going to happen is beyond your control anyway. Are there unseen forces at the helm of the ship? Who knows? Now, I’m not afraid of this type of riding, in fact I like it. Dirt roads grant you a view of something you just can’t see from its paved brother. 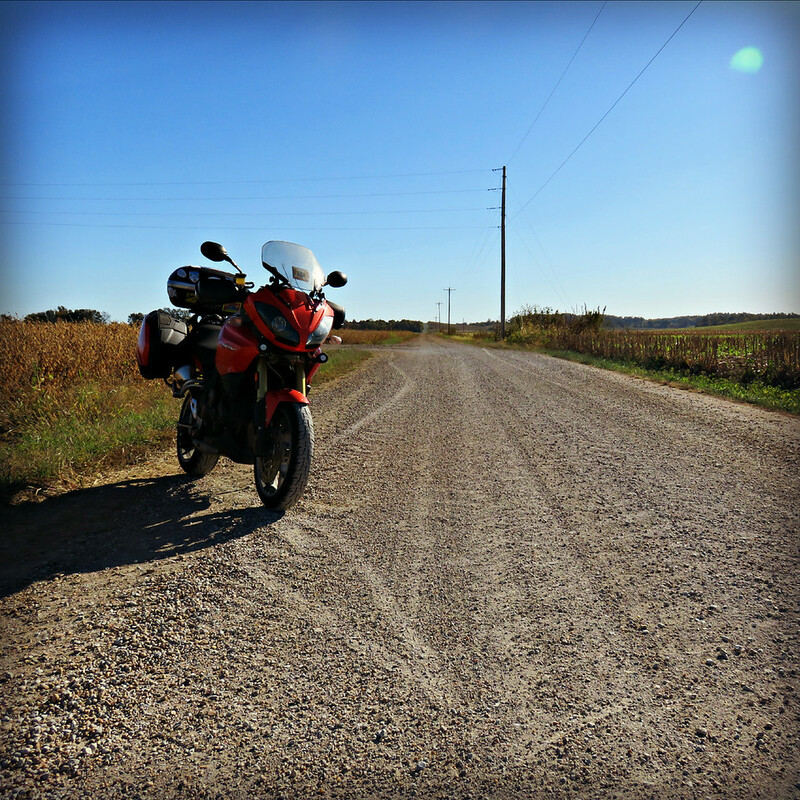 But to me, the Tiger doesn’t feel as sure-footed as other street bikes I’ve ridden on gravel roads. It could be in my head because it carries its weight up high and I’m always aware of its heft – but the Tiger never feels… “good,” on this type of road. It’s not the big girl’s wheelhouse. While riding here, I kept thinking that if I had a whoopsie on a road like this it might be a little while until help came along. Thankfully nothing out of the ordinary happened and I was fine. I just took in the farmland and the sunshine and went about my day. But you know? It’s when you’re on autopilot in seemingly innocuous situations that things go pear-shaped. Two days later? I tipped over in a parking lot. So true. I’ve survived crazy situations without incident and, like you, fallen over at 5 mph in a parking lot. Often that’s attributable to our brain’s hard-wiring — when facing danger, our mind concentrates fully and, when not, we’re sometimes careless. 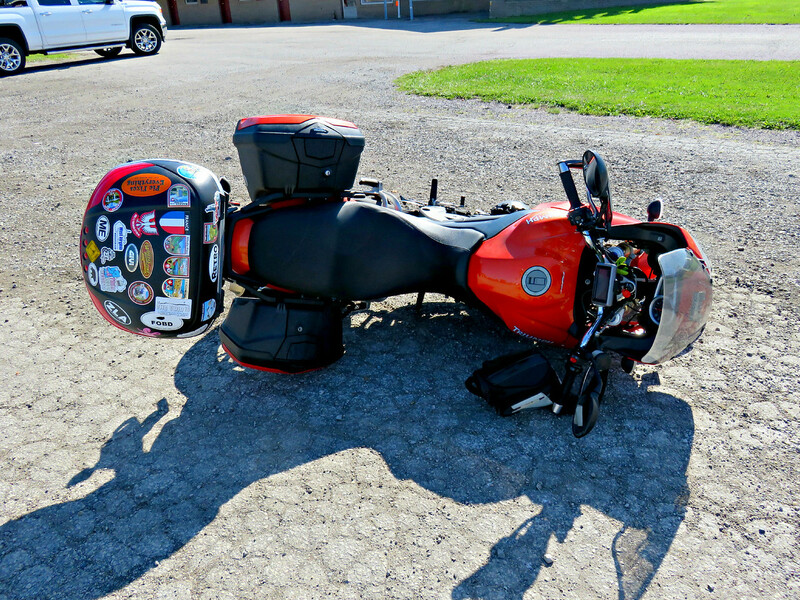 The only time I have tipped over my bike (at this point) was in my work parking lot! Sometimes it’s the “simple” things that catch us off guard. I’m glad you had your priorities right, Fuzz: Document first, then pick up the bike. We went off-road camping quite a bit when I was a kid, and with our group (several different families), the only acceptable practice was to first photograph mishaps and then solve the situation–whether drivers were high-centered on rocky ledges, or buried up to the floorboard in mid-river sandbars, or the time my uncle broke the U-bolts on the rear axle of his Ford Bronco on a rocky dugway, with the rest of the group behind him… First were photos of the axle just a-hangin’ there, and then photos of the axle strapped to the leaf springs with my dad’s tow chain and several bolts to tighten up the wad. My uncle drove with that setup for six or so months after the incident. In late fall, after the season, the group would gather to share photo slides, and my mom would bake up a batch of apple pudding (a cake with tons of shredded apples and a super-sweet sauce).